Given the harsh and miserable lives farmed animals endure in factory farms, teaching students how to care for these animals should include a particularly high level of compassion. Yet, Canadian animal health technology students are often taught a very different lesson: that farmed animals are only of worth if they are productive, and that it is acceptable to leave wounded or injured farmed animals without pain relief or care. Most students enroll in Animal Health Technology programs because they like animals, and want to be involved in their care. As part of their learning experience, students may train in a variety of settings, including intensive animal production facilities. “[The] pig barn is what made me stop eating Pork. The conditions of the facility were absolutely horrible. I remember looking in wheelbarrows and seeing a mound of dead piglets. All of which had bloody noses (from being bashed to death). We went to the newly born piglet pens to practice processing piglets. We would dock their tails, cut off their needle teeth, clamp their ears with a tattoo clamp, inject them with vitamins/antibiotics, and then castrate them. No anesthetic was ever provided and the instruments didn’t get cleaned after each individual pig. The worst part was allowing an animal health technology class of students, many of whom have never even used scalpels yet, to castrate the piglets without any pain control. Students would be nervous and would be going EXTRA slowly so that they didn’t make any mistakes. This disgusted me and I refused to take part. 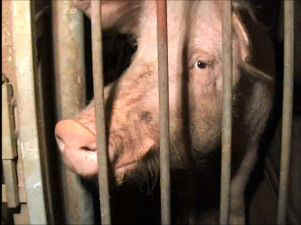 While these students may decide to never work on factory farms, the values they are taught – that farmed animals are ‘lesser’ than companion animals, and that their suffering is unimportant- can have deep consequences on the students, from the infliction of psychological trauma to the desensitization to the suffering of others. It is undeniable that until the last factory farm has closed its doors, farmed animals will continue to suffer, with or without compassionate animal health technicians. Until then though, the very least educators and industry workers could do is show some humanity and take the greatest care to mitigate and alleviate animal suffering, rather than trivialize their abuse and ignore their pain.